DXF, or Drawing Exchange Format, is an open sourced CAD data file format. It was developed by Autodesk in 1982 to enable data interoperability of 2D and 3D drawings between AutoCAD and other programs. Ever since, it has been updated several times, and the latest version (Release 14) supports both ASCII and binary forms. Files created with the earlier versions can also be opened with the later releases. A DXF file is composed of several sections - in the following order: Header (contains general information about the drawing); Classes (contains application-defined information); Tables (contains item definitions); Blocks (contains descriptions of entities); Entities (contains drawing entities); Objects (contains data of non-graphical objects); and Thumb-Nail-Image (contains preview of image). Each section has a code that is associated with its value. The code begins with a 0 followed by a string, and ends with a 0 followed by ENDSEC. Almost all CAD (Computer Aided Design) drawings can be represented by a DXF file. Its features include spline-based conversion of PS/PDF curves for better handling of contour information, support for both vector graphics and text fonts, support for 3D objects, associative dimensioning, option to keep or remove hatches and fills during conversion, and is easy to parse. DXF, with the file extension of ‘.dxf’, has been accepted and widely used by the industry since it is supported by most programs. Among them are Autodesk AutoCAD, IMSI TurboCAD, SolidWorks eDrawings Viewer, DWG2Image Converter, and OpenOffice.org Draw on Microsoft Windows; IMSI TurboCAD, SolidWorks eDrawings Viewer, OpenOffice.org Draw, PowerCADD PowerDWG translator, Microspot DWG Viewer, NeoOffice Draw, and DataViz MacLink Plus on Mac OS; and OpenOffice.org Draw on Linux. 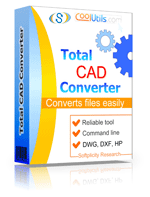 Total CAD Converter can convert DXF to PDF, TIFF, JPEG, BMP, WMF, PNG, DXF, BMP, CGM, HPGL, SVG in batch via GUI or command line.